12 jul 2017 - De veerkracht van steden ten aanzien van de stijgende zeespiegel kan vanuit verschillende aspecten worden onderzocht. In deze MSc-scriptie concentreerde Sumanth Subbarao zich op de sociaal-economische ontwikkeling in de San Francisco Bay. Hij vergeleek East Palo Alto en Foster City. Vanwege de verschillende gemeenschappen die er wonen variëren de sociaal-economische systemen van deze twee cases en door het type risicobeheer dat wordt ingezet bij overstromingen verschillen ze ook in kwetsbaarheid. Verder vergelijkt dit afstudeerproject de ruimtelijke kwaliteit en de synergie die ontstaan door deze sociale systemen. Zo wordt duidelijk welke kwaliteiten er al zijn en welke kwaliteiten moeten worden toegevoegd om een duurzame omgeving te creëren. Dit artikel is alleen in het Engels beschikbaar. The following research dealt with Climate change and its future scenarios where Sea level rise and extensive rainfall events can possibly increase the flood risk in the case of Delta cities. San Francisco Bay situated around an estuary and the edge of a delta faces threat of Sea level rise inundation and inland flooding. 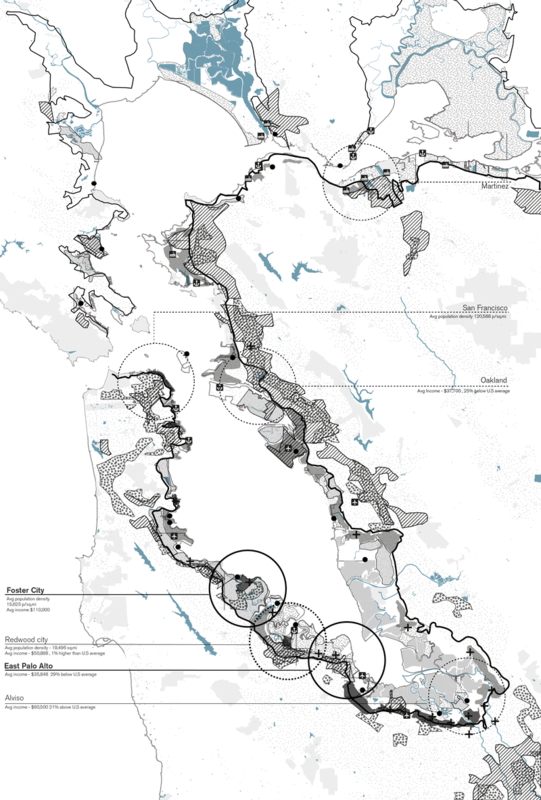 This thesis started with the observation that the bay consist of typologies of Land – water transitions that is bounded by several socio – economic systems which leads to a varying vulnerability to flood risk. The process develops a methodology to understand and compare the socio- economic processes of two urban cases and arrive at comprehensive design strategies that increase the capacity to manage flooding and guide developments towards a resilient future. This comparison portrays how socio- economic systems evolve in a similar regional context of San Francisco Bay based on several externalities that mould its unique social systems. The important element of study is the strong contrast between its socio- economic systems and the ‘variable’ vulnerability that it faces due to flood hazards. Looking towards a specific outcome for comparison the two cases chosen are East Palo and Foster City which is located on the south of the bay. The increasing vulnerability of urban systems to flood risk is largely caused by process of urbanisation, socio- economic change and human – induced stress to the natural system. Just a few miles apart, the two cities are located on the edge of the bay with high threat towards sea-level rise inundation and inland – flooding. In the regional context both the cities have a pressure for development from Silicon Valley, however, one has succeeded in absorbing these changes compared to the other. East Palo Alto has remained as a haven for Low- income communities and deprived of development with little or no access to basic infrastructure. The economic system has failed to add a fresh lease of life and continues to struggle to balance and uphold these communities. On the other hand, the city of Foster City was conceived with careful planning and regulations that foresee a vision for high quality of living and economic development. In this context of strong contrasts, it is not possible to arrive at a single solution for adaptation. The project was part of the graduation lab of Delta Interventions research chair (DI-Tudelft) which focused on the theme of adaptation by design in San Francisco bay region. The relationship with the waterscape of the bay, its dynamics and the future challenges were the pre-requisites of the studio. It is important to note that the bay region is a complex dynamic system and a region of disparity with both affluent and low- income communities that live and embrace the bay and low – income communities are more vulnerable to climate change and its threats (Jabareen, 2013) . This formulated the first focus towards research to apprehend adaptation in two contexts. Adaptation is not a linear process but a transitional one which evolves over period of time based upon the change in local context and external influences (van Veelen et al., 2015). To build adaptation is to understand the spatial – temporal change at different scales that enables to establish cross scalar interaction of different elements. The mapping of the historical transformation of occupation, landscape and infrastructure elements by utilising the layer approach (Hoog et al., 1998) did enable to establish connection between the regional scale and its impact felt at the local scale. This was also helpful in understanding how the local economy was transformed along with the social system that is moulded into the current urban structure. The historical development of both the systems also depicts the contrasting change that has occurred with an image of the past identities of the two cities that has been transforming over the years. This was also a key component in formulating specific visions for both the cases that dictates design strategies to implement adaptation principles in its individual context. Since every urban system is a complex dynamic system with several interrelated networks acting together it was important to break this system in terms of sub-components i.e. user, occupation, metabolism, infrastructure and subsurface to understand its overlay. The Urban climate framework (UCF) (Döpp et al., 2011), provides this framework to analyse the interdependencies and the dynamics of change. For example the dynamics of users is much higher compared to infrastructure and sub- surface which is less dynamic. The framework also enabled to comprehend the rate of change of each layer and the cost involved in adaptation. The research methodology comprised of utilising a system based approach to understand resilience and sustainability in the two urban systems. The mapping in two cases shows the differences in risk and the type of risk management that is employed. Several factors play a role in this relationship like the institutional capacity that highly varies on the political willingness and planning. A cash- strapped East Palo Alto makes little effort towards providing a high level of protection from floods towards its residents whereas an affluent Foster City has good resources to provide a certain level of protection. Thus the socio – economic systems determine the type of flood risk it faces. The aspect of urban resilience can measured based on the city’s ability to accommodate flooding rather than resisting it. The resistant city is dependent on flood – control infrastructure, functioning only in the dry conditions and having little tolerance of socioeconomic state changes. On the contrary the resilient city tolerates flooding and much greater fluctuation in socioeconomic conditions thus greater resilience to floods. The implication of this theory can be understood with new system of planning initiative called ‘water sensitive cities’ that integrates water management into urban planning and design to promote resilience to climate change (Howe and Mitchell, 2012). Another important element of understanding flood risk in terms of resilience is by measuring its capacities in terms of threshold, recovery and adaptive capacities (De Graaf, 2009). The capacities are measured by analysing flood risk management and designed probability of floods. This comparative analysis represents the resiliency of both the cases and adds to the component of design which aims at increasing capacities and building sensitivity towards water. Incorporating spatial intervention into the urban systems can be achieved by analysing sustainability components (Van Dorst and Duijvestein, 2004) to build the relationship between projects, prosperity, people and planet. The model developed to understand sustainability in the built environment where different processes are interlinked to attain a certain balance. The important aspect of sustainable development is the synergies between the various elements that show what do these socio- economic systems value. In the case of East Palo Alto, it is visible that certain basic elements such as pavements or an open space may not exist, which may not be the concern of its residents. As a Low-income community, a shelter on their roof and food on their table may be their top priority. 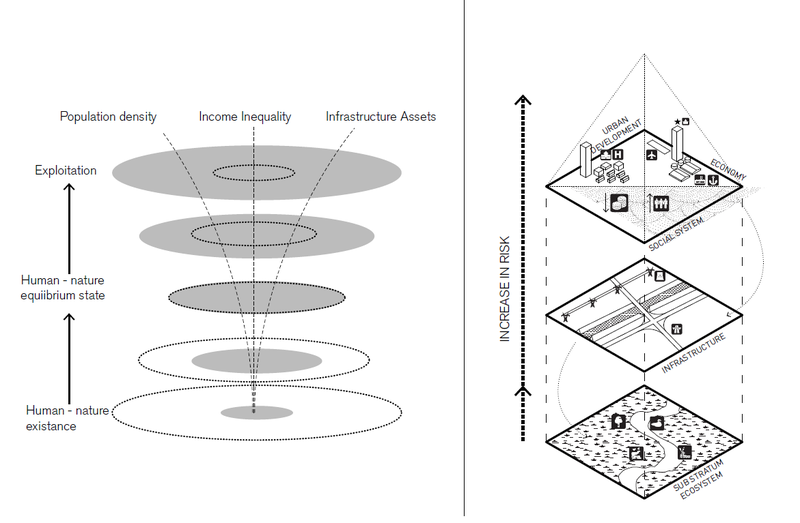 The socio- economic system adapts to its societal conditions and needs, however, as a designer it is important to balance these systems and values, taking into considerations the grievances of the social systems and looking towards a holistic solution. This also defines the ethical dimension of this project. The comparison of values and synergies determines objectives of design which aims a balance in every domain. An eye level perception shows how the social landscape determines the cultural and the ecological landscape. This contrasting differences in both the cases helped steer towards design strategies that vary in each case and tailor made to its urban contexts. The evaluation of both the systems helped determine the pathways for adaptation by building synergies into its social, ecological and economy components. Combining this approach with ‘water sensitive design principles’ lead to two different visions in each case, specific to its context. A ‘water in economy’ and ‘water in ecology’ approach was developed in East Palo Alto and Foster City respectively, where the potentials of each urban systems where enhanced by adding new values and synergies through nature based infrastructure that is dynamic and flexible to provide a resilient flood risk management that can face future climate uncertainties. Comparing the Urban systems in both the cases provides a platform for cross – learning and opportunities for sustainable growth. As mentioned earlier managing growth and development in a similar regional context relay upon the planning and institutional capacities to advocate change and adapt their socio – economic system. San Francisco Bay region has undergone numerous economic transitions that has affected the liveihood of several communities (in the case of East Palo Alto), as well generated opportunities for new communities (Foster City). However both the cities have been resisting flooding events and sometimes failing to cope with extreme events that has pushed its socio – economic systems into undesirable regimes. (In the case of East Palo Alto). Global climate is undergoing a trend wise change and managing future flooding events has to undergo a transition which looks at combining the different aspects of living, economy and environment (a system as whole) in building adaptation. The key to successful adaptation of urban environment is to effectively see moments of change in urban development and management as windows of opportunity for low- cost adaptation, and to yield multi - benefits. Retrofitting an existing community has to be the priority which can add new qualities and build resilience in to existing system. To enhance sustainable growth is to develop projects that would yield social and ecological interaction, uses nature based performance and adds economic value to the environment which builds a self-sufficient system in the near future. DE GRAAF, R. E. 2009. Innovations in urban water management to reduce the vulnerability of cities: feasibility, case studies and governance. DÖPP, S., HOOIMEIJER, F. & MAAS, N. 2011. Urban climate framework: A system approach towards climate proof cities. Resilient Cities. Springer. HOOG, M. D., SIJMONS, D. & VERSCHUUREN, S. 1998. Herontwerp van het Laagland. Het Metropolitane Debat. Thoth, Bussum. HOWE, C. & MITCHELL, C. 2012. Water sensitive cities, IWA Publishing. JABAREEN, Y. 2013. Planning the resilient city: Concepts and strategies for coping with climate change and environmental risk. Cities, 31, 220-229. VAN DORST, M. & DUIJVESTEIN, C. 2004. Concepts of sustainable development-The 2004 International Sustainable Development research conference–Conference proceedings 29-30 march University of Manchester. University of Manchester, United Kingdom. VAN VEELEN, P., VOORENDT, M. & VAN DER ZWET, C. 2015. Design challenges of multifunctional flood defences. A comparative approach to assess spatial and structural integration. 2015, 3, 18. De volledige scriptie ‘Variable Vulnerability: A comparative understanding of different socioeconomic systems - San Francisco Bay region’ leest u hier.